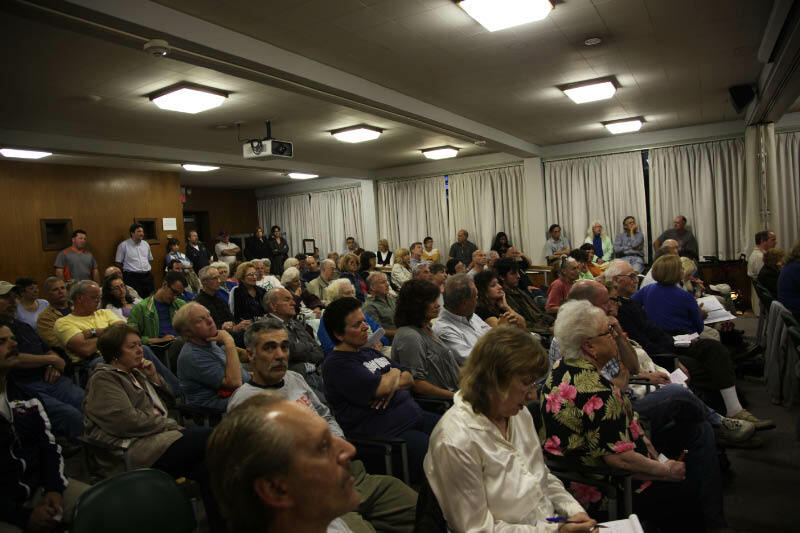 A standing-room only crowd at the Levittown Property Owners Association Meeting on Tuesday heard a developer's representative make his case for building a senior housing development on a historic section of the Long Island Motor Parkway. Highlights below. 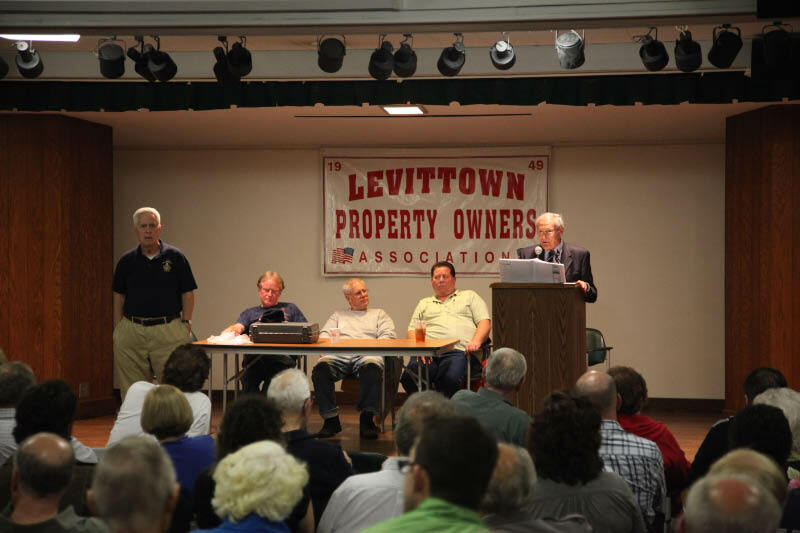 Tuesday's meeting attracted nearly 150 Levittown residents. The Levittown Property Owners Association (LPOA) meetings have been filling up over recent months with residents concerned about facilities proposed for the now vacant Crocus Lane and North Village Green properties. William Cohn, an attorney representing the Crocus Lane case, stole the show Tuesday evening at the LPOA's monthly meeting, sharing a basic thumbnail sketch for a condominium community for people 55 and over. According to the plans, the 50-unit estate will stand at 27.5 feet, offer one and two bedroom condominiums for less than $300,000. Cohn tried to make it clear to all at the meeting that the plan is working around existing Levittown residents who may be effected by the construction. "There will be 6-foot high PVC fencing and beyond that, a very extensive tree planting providing a living fence 10 to 12 feet in height," said Cohn. "Also keeping surrounding houses in mind, there will be no balconies on the units." That wasn't enough to ease the minds of the neighboring residents. Several questions arose at the meeting regarding taxes, construction, garbage removal and security. "We do not have an exact figure on the taxes, but based upon the conversations with the assessor the taxes are probably going to be about $8,000," Cohn answered. "The garbage pickup can be individual from each home," he added. "But, it's really something that community will have to decide on their own whether they want it from their home or a dumpster in the back of the lot. Sanitary conditions can take care of the odors, but generally speaking, I think the preference would be for everyone to put their own garbage out like they do at homes." The attorney also told the crowd that the road within the estate leading to each house will be within 5 feet of the backyards of homes lining Orchid Road. When asked, Cohn said the owners are hoping to do this project within a year, there are still a few things that need to be worked out before they begin building, including a change of zone. "We have to go through the Hempstead Town Board and the Nassau County Planning Division, and before we offer it for sale to people, we'll have to get it approved by the Attorney General of the state of New York," Cohn explained. "The zoning requires 133 parking spaces and right now we are at 117, so we'll have to go to the board on that also." 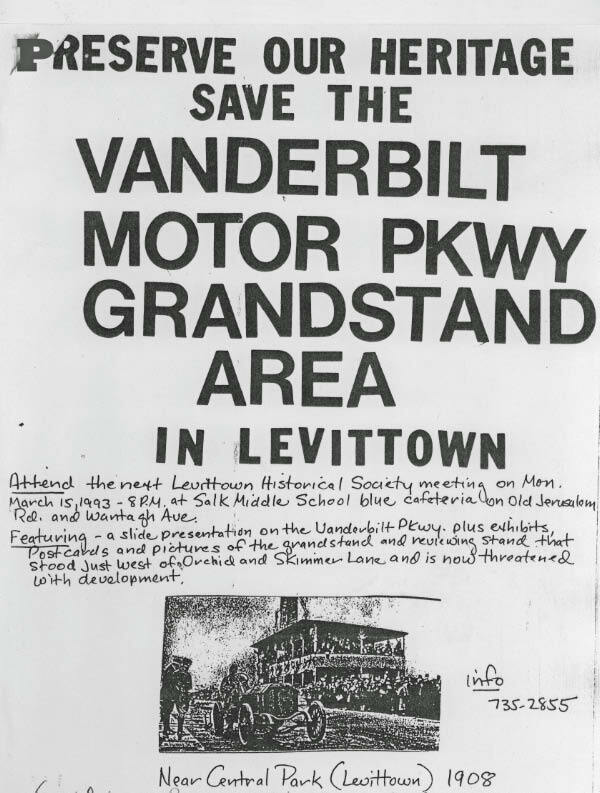 The representative for the developer described the senior housing complex that would be built on the right-of-way of the Motor Parkway and location of the Vanderbilt Cup Races grandstand and press box. The complex would consist of a road and a 50-unit complex, each unit selling for over $300,000. No plans for the complex were provided. In order to build the complex, the developer will need to receive zoning variance approvals from the Town of Hempstead. Following the presentation, the audience was given the opportunity to pose questions but not make any statements. 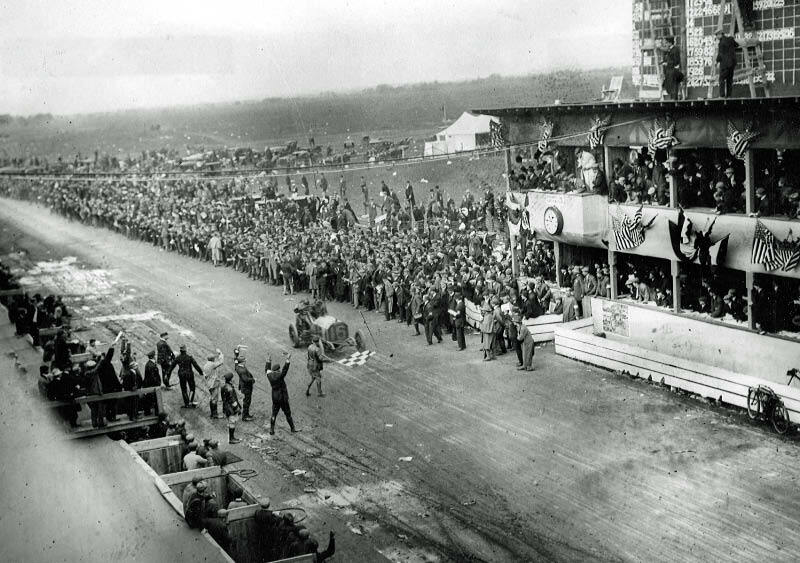 Introducing myself as the Town Historian of North Hempstead and the author of "Vanderbilt Cup Races of Long Island" and co-author of "The Long Island Motor Parkway", I asked the representative if there was going to be any attempt to preserve the Motor Parkway or place a historical marker in the complex. The representative stated; "There currently no plans to indicate the history of the area but we may consider it." 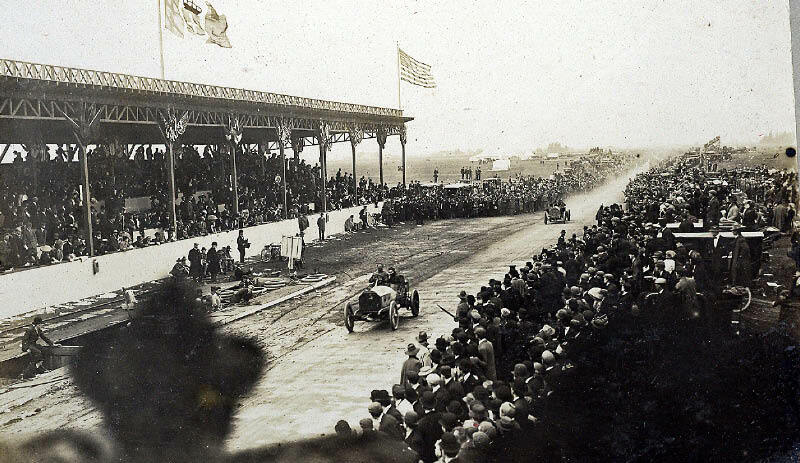 On October 24, 1908, this site was the location for the start/finish line in which the first American car won a major international road race. I then asked the representative why the developer rebuffed efforts by Nassau County to purchase the property as a park for the Motor Parkway Trail. He responded the location was "too small for such a quaint venture." A Levittown resident quickly asked ; "How could the location be "too small for a park but large enough for a 50-unit multiple family housing complex and a road?" As seen in this 1993 poster, this development of this property has been fought for over 20 years. The next step will be a presentation requesting a zoning variance by the developer before a future meeting of the Town of Hempstead Planning Board. I encourage everyone in favor or opposed to this zoning variance to attend this meeting. As soon as information on this meeting becomes available, it will be posted on VanderbiltCupRaces.com . I welcome any comments on this development below. Thanks for attending the meeting Howard. Your historical perspective always provides another view. I’m writing due to my continuing interest in the property in Levittown that comprises the former Long Island Motor Parkway. My interest stems from my having lived adjacent to a portion of that property growing up in Levittown some years ago, and later working with the LPOA on behalf of my mother and father. The most recent development proposal was from Josato LLC (which I understand to be the successor to Terra Homes). I believe that the development that is proposed would be profoundly adverse to the interests of all homeowners—not only to those on adjacent properties, but to all Levittown residents, due to the evisceration of the local zoning law (the Levittown Planned Residence District, or “LPRD”) that would be necessary for the development proposal to proceed. A development of the type contemplated would require the Planning Commission and other bodies to nullify the LPRD provisions that are intended to (1) provide for health, safety and welfare of residents from risks resulting from increased traffic, as well as inability of fire, sanitation and other services to access properties; (2) ensure the stability of the character of the Levittown neighborhood in its original design as a location for single-family homes; (3) in general, avoid the piecemeal intrusion of non-conforming development in what is a holistically designed—i.e., planned—community. 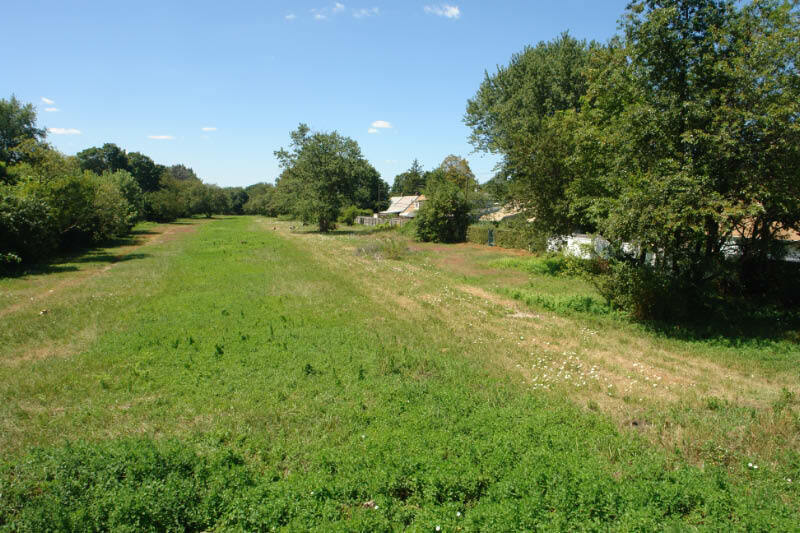 The deleterious effects on homeowners could be avoided by the use of the LI Motor Parkway land as a park, or even through residential development that is in compliance with LPRD requirements. I believe that such a conforming use would also honor the spirit in which the LI Motor Parkway was built and used—for the benefit and enjoyment of many, not a handful of developers. You should note that there is a significant back-history to the sale of this property to Terra Homes in the early 1980s. 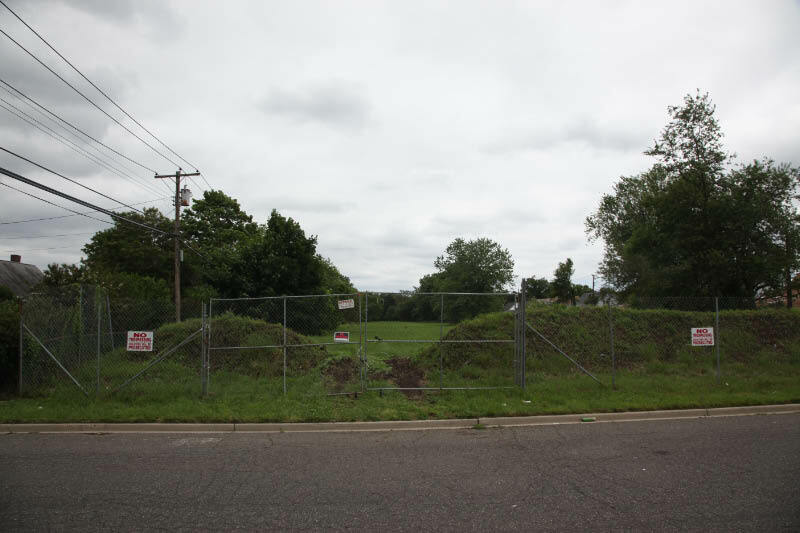 If memory serves, the Crocus Lane parcel was acquired by Terra from Nassau County at a knock-down price in the neighborhood of $50,000—the low price being attributable to the limited development that is permitted under the LPRD. Given the low price paid for the land (which can be verified through County records), any claim that variances are necessary to develop the property profitably should be regarded as nothing more than a falsehood. Nonetheless, I hope that you and those in attendance will gave a fair but skeptical hearing to all points of view, but bearing in mind that Levittown was created as a special community—for the benefit of those who fought for this country and were lucky enough to return to these shores—and the safety and welfare of residents must always override the private enrichment of a few. i thought that Nassau County & Ed Mangano were going to try an use that piece of land as part of the Nassau County Trail that they were proposing to make? I agree it would make a great park/hiking or walking & biking trail. Why don’t they use it for that purpose like they talked about doing some time ago. I hope that they do not build any homes on it lets keep it as open space and preserve it for futur generations to enjoy and maybe even have it noted with a marker where the Motor Parkway Grand Stand was located. I believe negotiations broke down when the developer valued the property as if the zoning variances would be granted. “My take-aways from the Crocus Estates’ Q&A ‘Advertorial’ at the LPOA, June 12 meeting. Does the developer have a backyard to his property, his home, his place-of-residence? Is it of any historical value? If not, perhaps he could consider building the unit in that space. At some point in any of these discussions aimed at overloading the precious slivers of Long Island and wiping out our Island’s rich historical background the proposition of IN-YOUR-BACKYARD needs to become to rally cry. Thank you Howard for all of your efforts in these ongoing scenarios. as a long time LIMP aficionado I am appalled. PLease keep us informed when the next date is.